I never thought I would be writing about a “do it yourself” funeral. I don’t like using the term “do it yourself” as it might give the impression that we did things on the cheap or unprofessionally, so I shall prefer to call Mum’s funeral an intimate “family led” funeral. I am writing this article with my father, so that others might do as we did, without fear and with confidence that keeping our loved ones at home after they die is the most natural and perfectly right thing to do, and that sending them off to a morgue is perhaps one of the most alien and strange practices our society has adopted. At the time of a death, inevitably the deceased’s family encounter much distress and anxiety. 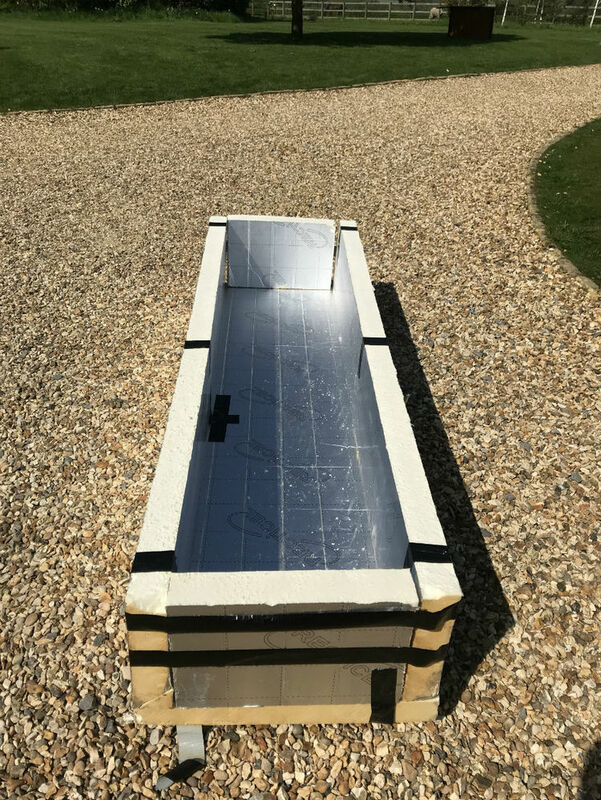 The prospect of arranging a funeral yourself is daunting and thus contracting out this to an undertaker can be a logical and sensible decision. However, Dad was adamant he did not want to do this. Dad started talking about keeping Mum’s body at home about a week before she died. He said he didn’t want to hand her over to undertakers we had never met, and that we would be looking after her ourselves. Having been her primary carer, he had plenty of time to consider what might happen and decided to handle everything “in-house”. 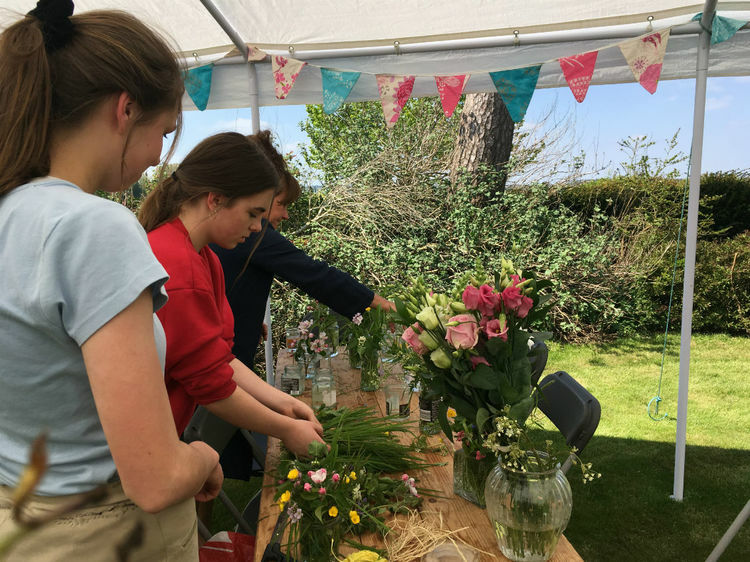 It would give us the opportunity to extend the love and care we had contributed prior to Mum’s death and thus ensure that everything would be exactly as we thought Mum would want. Dad had it all planned out; being an engineer he tackled the technicalities of keeping Mum cold enough head on and he came up with a simple and yet highly effective solution- it involved a box made from solid foil backed insulation, the type used in new-builds, some duct-tape, and some polythene sheeting, ice packed around the body. Sounded simple. We all had our doubts of course, and I was secretly dreading the idea that Mum’s body might rot or that we would all be traumatised by having a corpse in our house for a week, but my worries turned out to be completely unfounded, and if fact Mum ended up having the most beautiful, intimate and loving send offs anyone could give her. Mum died peacefully after a long battle with cancer. My sister, father and I were fortunate to be able to care for her at home right until the end. Dad did not want her to go to a hospice or a hospital, and keeping her at home was a blessing, even when she was really ill in the final days. With the help of a charity called Laurence House Nursing and the district nurse, we had a hospital bed and all the drugs mum needed to stay comfortable. My sister and I had recently attended a day retreat on Celtic Christianity and found that playing gentle Celtic music was very calming. 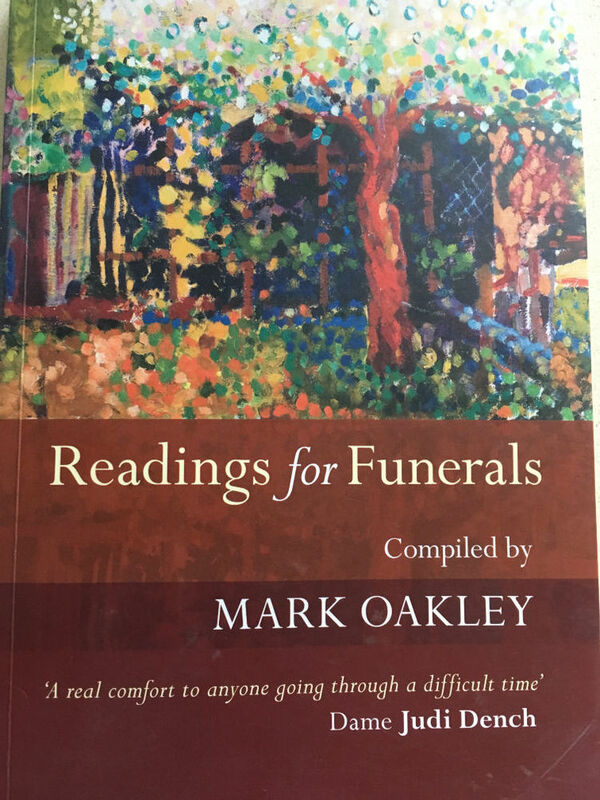 We also took turns reading poems and prayers from a fantastic book called "Readings for Funerals" by The Reverend Mark Oakley. Even though Mum could no longer speak, doctors say that hearing is often the last sense to go, and thus reading poems, Bible passages and singing hymns to Mum was an important part of caring for her. I had never seen a dead body before and I had been having nightmares about seeing Mum’s body and I wondered if I would even want to see her again after she died, but in fact spending time with Mum and washing her just as if she was alive, rubbing essential oils into her skin, dressing her and kissing her on the day she died came naturally to us all. We then laid her peacefully on her bed with a cross in her hand and a dusting of bronzer and lipstick, and she looked so serene and beautiful. The grandchildren came to visit Mum straight away and some of them found it upsetting to see her, but they were all able to say goodbye to her and to give her a kiss. The children ranged in ages from eight to fourteen and most of them wanted to see Granny. The youngest two who were five and six didn’t want to see her at first, and we respected their wishes. Interestingly though, two days later they declared they wanted to see Granny, and as she was at home, we were able to take them to her, which allowed them to say goodbye properly. My husband and I were sent straight away to the supermarket to buy as much ice as we could fit into our car, and we did indeed fill a whole trolley with ice. 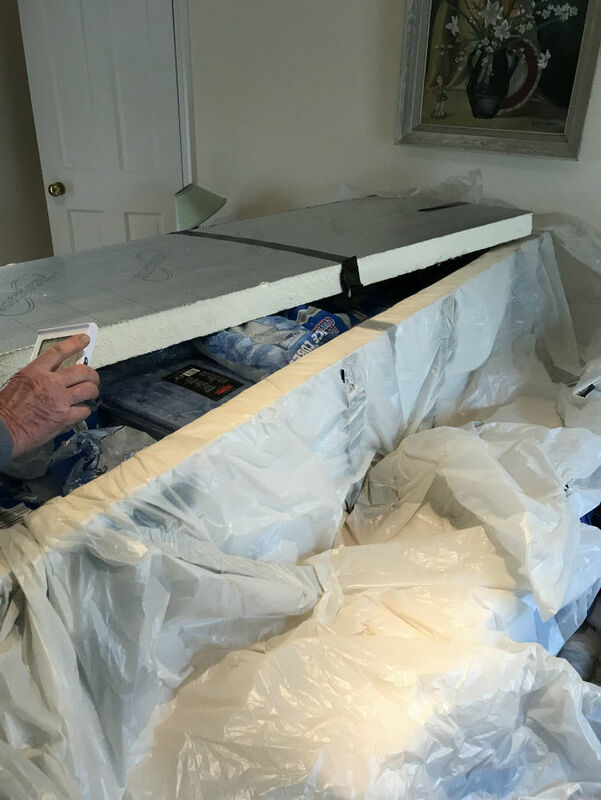 Dad had prepared a special box from an insulating material (see appendix below for a detailed description of the design) and we wrapped Mum in a sheet and carried her to an upstairs bedroom and placed her gently into the box that evening, and then surrounded her with bags of ice. In retrospect taking her upstairs was quite difficult and we would recommend choosing a downstairs room if possible. Each day some of us checked on Mum, which meant opening the box, checking the ice was not melting, checking the temperature. We could take the cloth from her face and gaze at her beauty and it was a lovely way to connect with her and say our goodbyes. We kept her for a week in total and we found that by then quite a bit of the ice did melt (we placed bags of ice on top of her as well as below her). We supplemented the ice with cool packs we had by now frozen that we bought on Amazon on the day she died. These did keep the temperature even colder and there was a benefit in that they did not leak any water the way the bags of ice did, but the ice bags had a way of moulding around Mum which the ice packs did not, so a combination of the two was perfect. 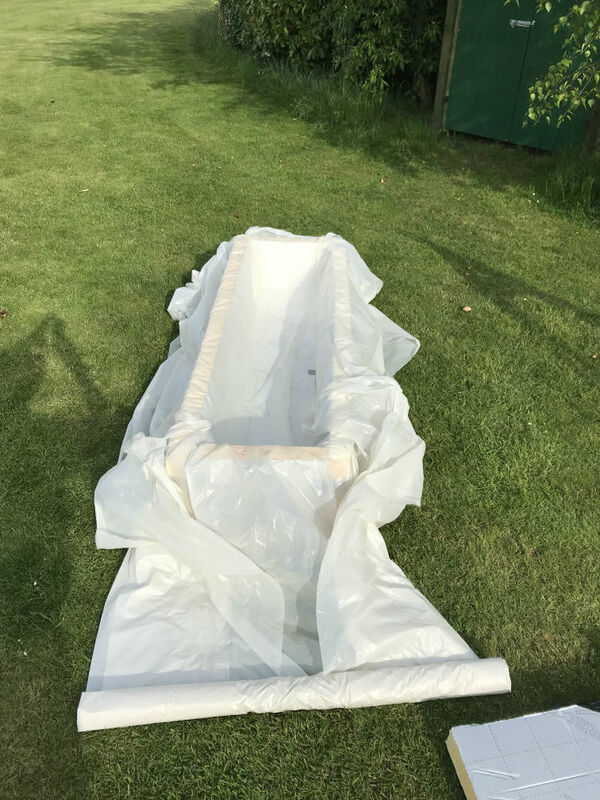 We found that there was some inevitable water pooling at the bottom of the box which is why it is essential that you line it with the polythene sheet. I had always wondered what would happen to Mum’s body over the week and I was relieved to see that we managed to preserve her perfectly. The skin on her hands became a little wrinkled - a bit like you get after swimming for too long, but her face was just as it was when she died, and we were greatly comforted by this. The act of checking on Mum every day was cathartic especially for Dad; it became a ritual, and we all felt that Mum was still with us at home where she belonged. Looking back, I could not now bear the thought of her being taken away to a mortuary by people we didn’t even know. Mum’s funeral itself was also going to be intensely personal with our family stamp on it, and we did not want to involve any strangers. 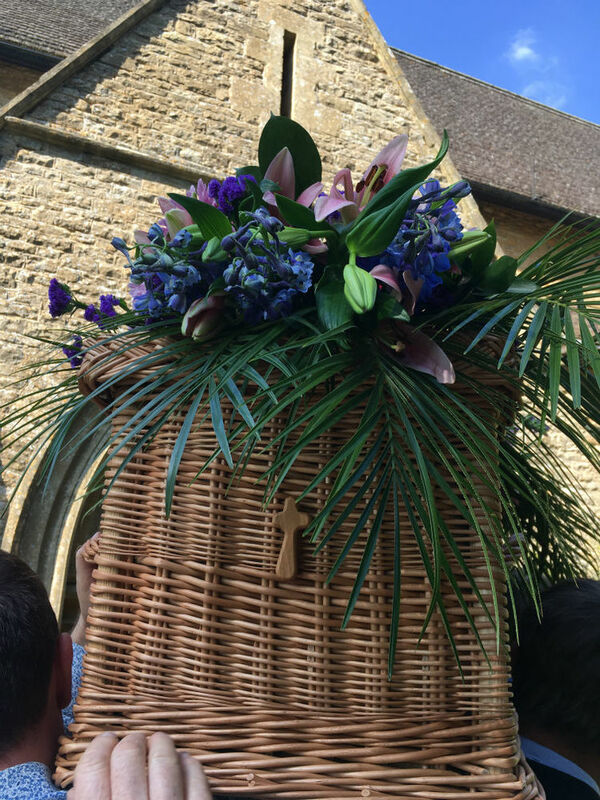 Dad bought a simple wicker coffin online, so simple in fact that you could see through the wicker, so he went to the local fabric shop and bought some material which he used to line the coffin, securing it with a glue gun. He also fixed some wires to the lid which we used to weave the flowers to the top of the coffin on the day of the funeral. 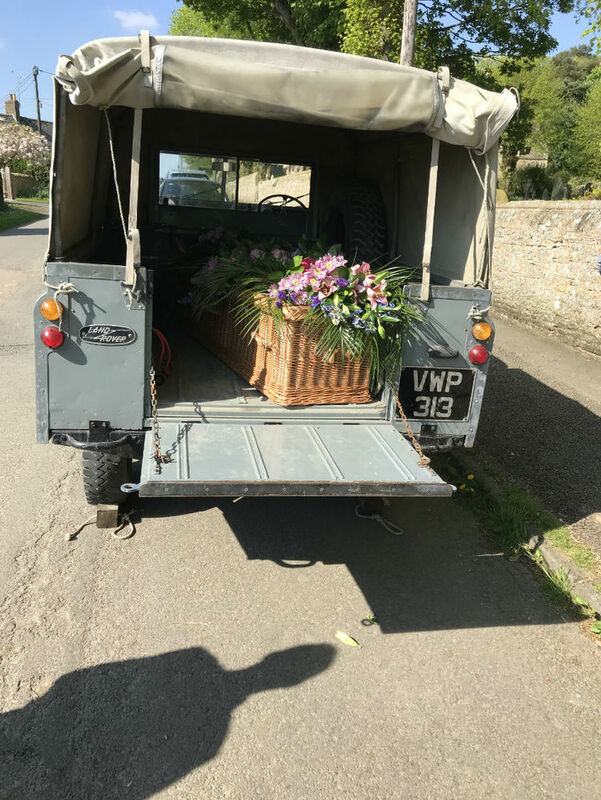 We decided we would transport Mum from home to the church in Fergus’s old Landover; we have always hated the look and feel of dark black hearses, and there is no law against transporting a body in a private vehicle. You just need to make sure it is long enough. Mum’s coffin was 192 cm long. 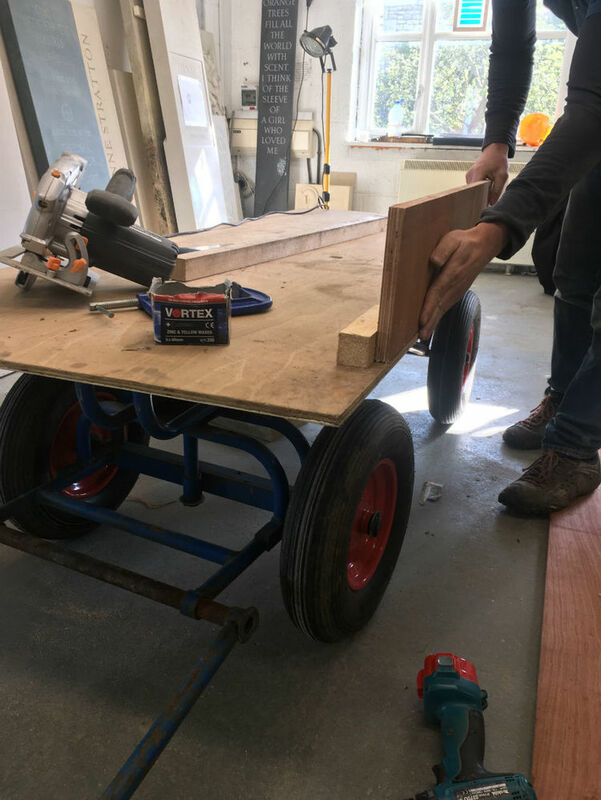 To transport Mum from the Church to the Cemetery, a distance of 300 metres, we decided to modify Fergus’s work trolley and Fergus built a simple wooden box over his trolley, painting it white. 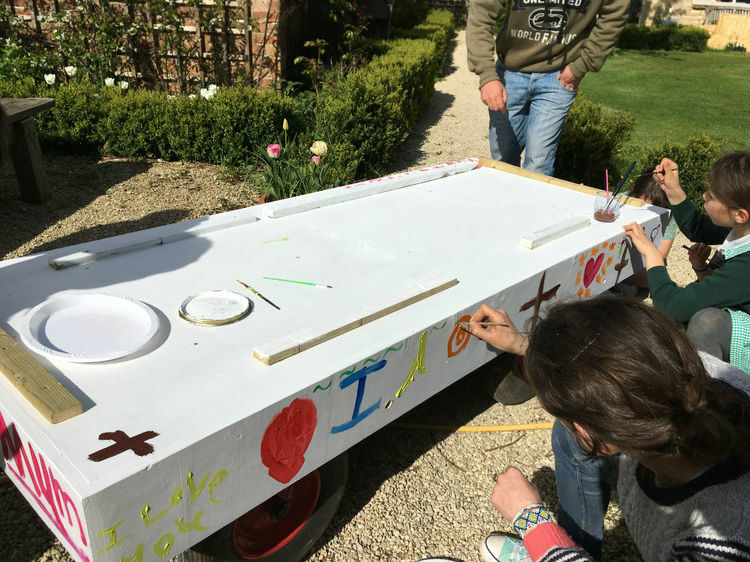 We then got the grandchildren together one evening after school, cooked a big curry, and handed them all paintbrushes and poster paints, and set them to work on decorating the trolley. It was one of the most moving and beautiful evenings, and even my mother in law joined in adding her touch. We stapled some ribbons around the edge, which we used to tie forget-me-nots to the trolley at the last minute. As we didn’t use any funeral directors, I needed to get the service sheet printed myself, and I used the template below that the vicar provided. I added readings and poems chosen by Mum and together with Dad and got our local printers to produce it. Choosing the readings and poems, I found myself referring again to my own blog post, this time as an outsider, and I read the poems I had chosen some years ago with a different perspective. Poetry was very healing and powerful and I found a few poems that have really helped me, which include Maya Angelou’s “When Great Trees Fall”. I have also recently been recommended a book called “Our last awakening” by Janet Morley, poems for living the in the face of death. Click here to see the order of service. 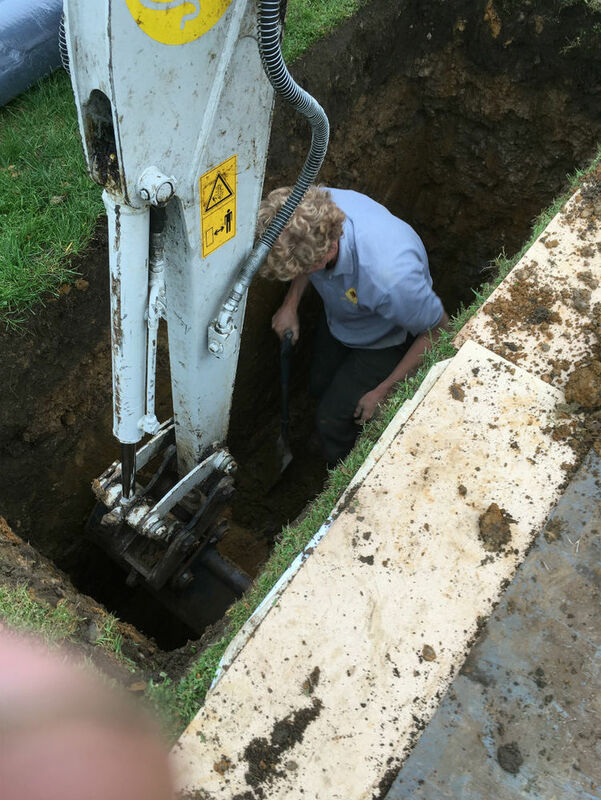 We could have contracted a specialist gravedigger to dig the 6-foot-deep, 2-foot wide grave, but, having been told the specifications by the Parish Clerk, we used a friend who had his own mini digger. 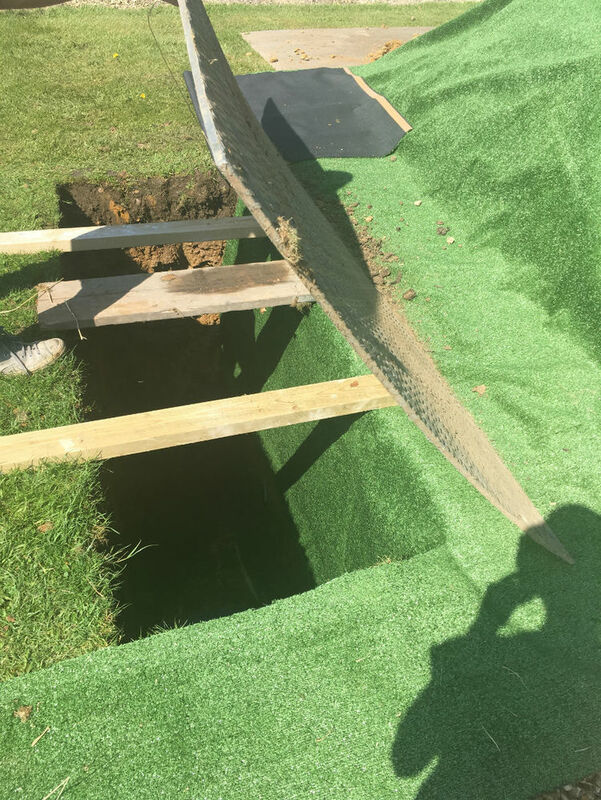 The spoil was laid, as directed, close to the grave and we used a 4m x 5m strip of AstroTurf to cover this and the grass adjacent to the grave. 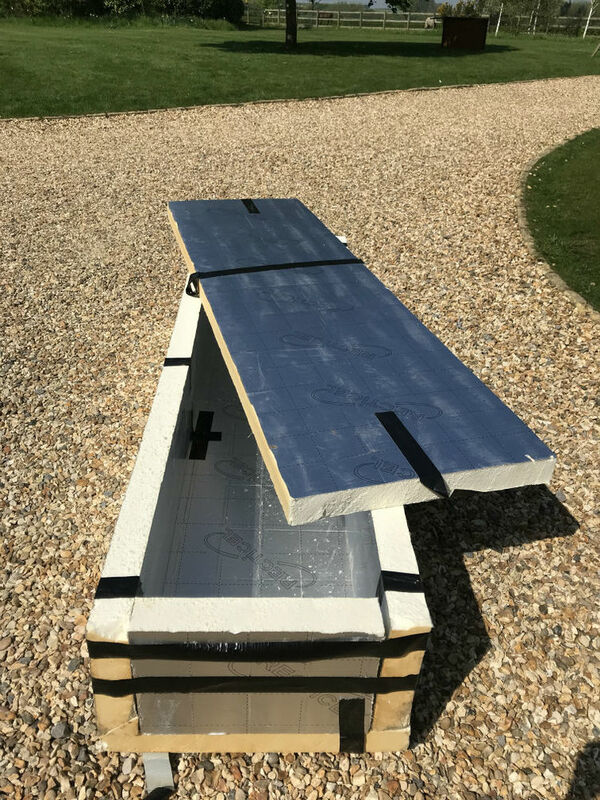 We bought two 10m long nylon straps to ensure that the coffin could be lowered easily into the grave after first resting it on two lengths of wood placed across the grave. 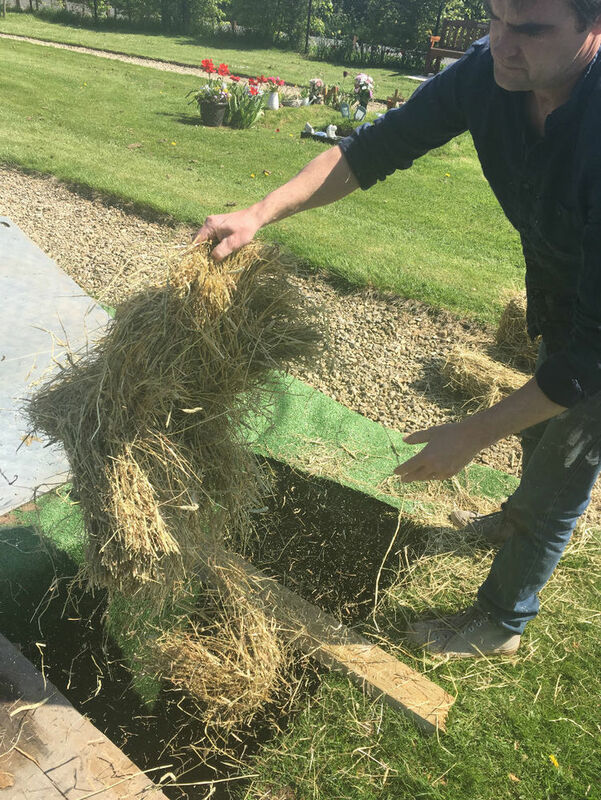 On the morning of the funeral, Fergus and I took a bale of hay to lay into the bottom of the grave which made it look less dark and more inviting. We did not order any special funeral flowers. We simply let the church ladies who always do the flowers decorate the church as they wish, requesting that they use pinks and blues and whites, which Mum always liked. 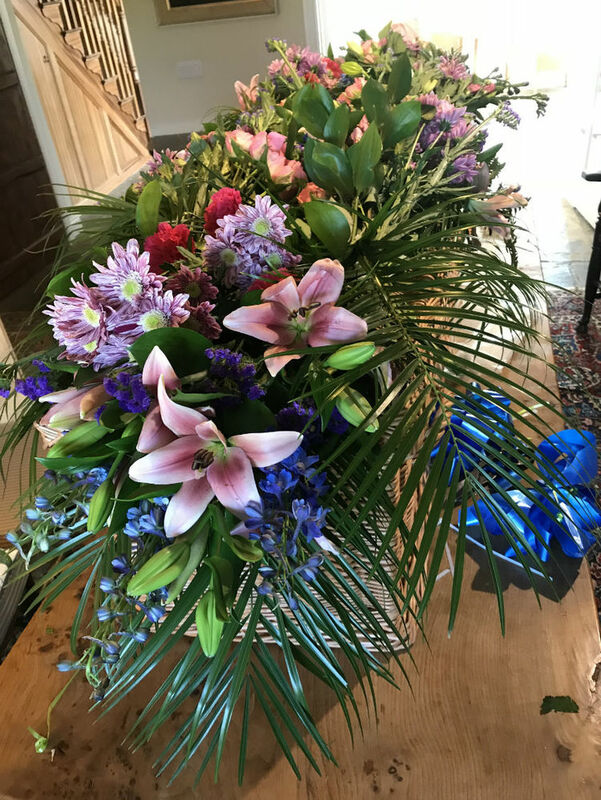 We then rang our lovely local florist, Ivy’s and simply asked for six bouquets in pink and blues and they delivered the most stunning flowers. We then arranged them using the wire Dad had pre-placed on the coffin, and Mum’s coffin looked so feminine and pretty. Dad added a finishing touch- a wooden cross that Mum had liked stuck to the back using a glue gun, and it looked lovely as I followed the coffin into the church. For the reception after the funeral, we arranged our own flowers taken from Mum and Dad's garden. Lifting Mum from her cold box into her coffin needed four strong people, but it was not very difficult. We did not want everyone to wear black on the day. It turned out to be one of the hottest days imaginable and Dad decided to wear his cream summer suit and a pink tie, and he looked so proud and handsome! 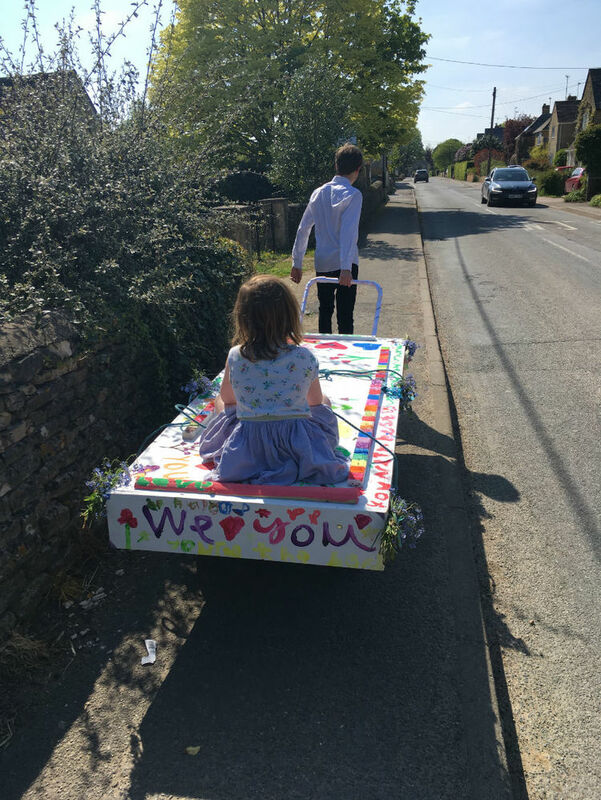 On the day of the funeral, our children pulled the trolley through the village to the church, like a parade announcing the death of our beautiful mother, and my daughter got a lift on the top! 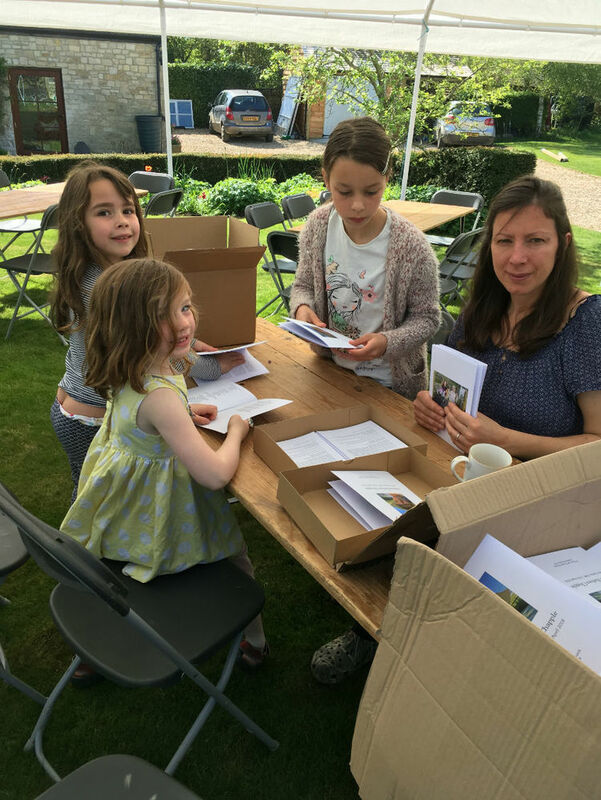 It was a wonderful bonding experience for the children and Mum would have loved it. The funeral itself was well attended- about 240 people flocked from far and wide to say goodbye to Mum, and we were treated to a video that mum had made last year when she was first diagnosed, which was incredibly moving. Our local choir sang Psalm 23 and we had some lovely readings and hymns. 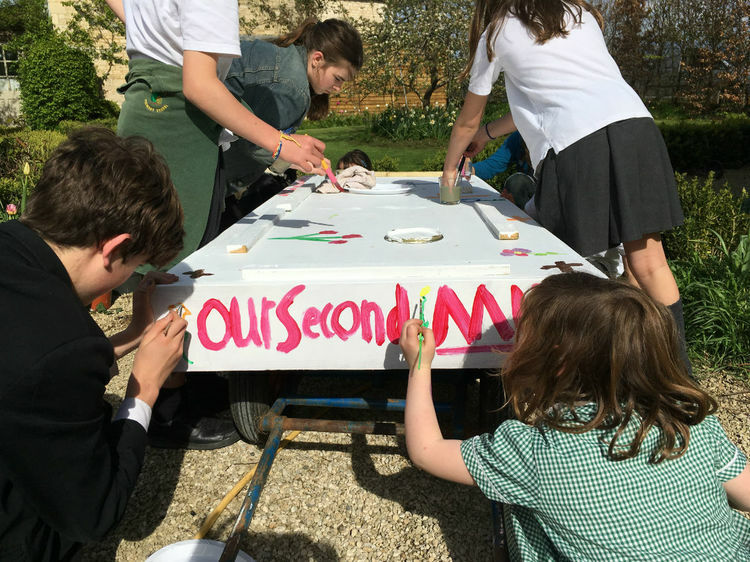 We were blessed with beautiful weather, and as I walked out behind Mum’s coffin, carried by six strong cousins, and I felt the sun shining in onto our faces and it was almost as if God were shining his love on Mum and taking her home. 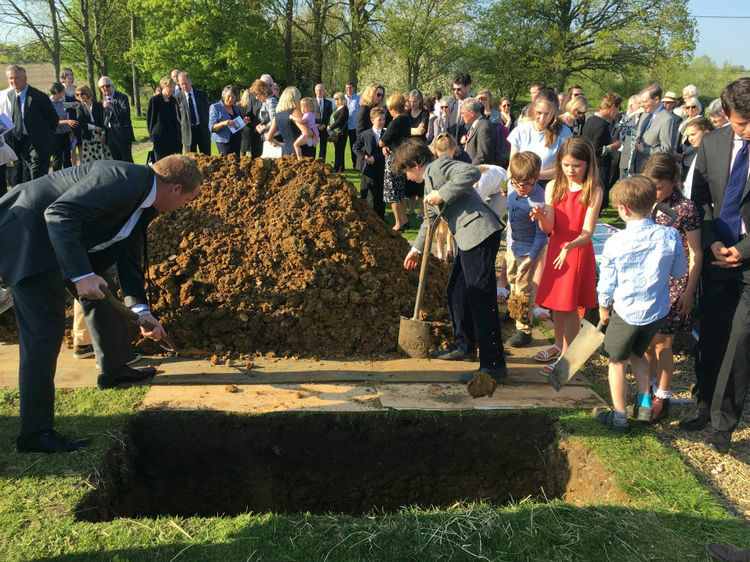 Having been directly involved in digging the grave the night before, Dad was determined that the burial itself was also going to be intensely personal. We ended up singing the prayer “Make me a Channel of you Peace” outdoors. 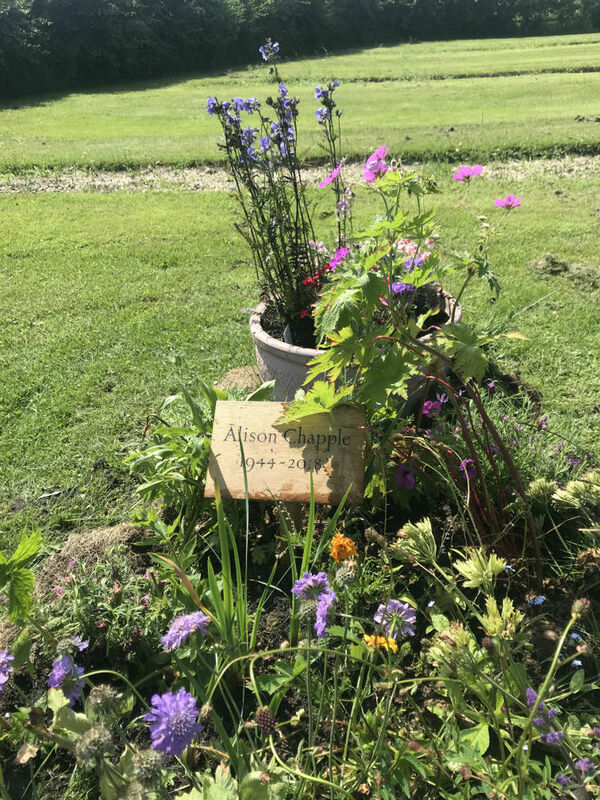 Having then lowered Mum gently into the grave, Dad produced a pile of wellies and about ten shovels and spades and announced we needed help filling in the grave! The children all joined in, even those in immaculate white suits and it was a wonderful sight, as we all joined together in putting Mum into her final place of rest. It provided a focus and time of contemplation rather than just walking away and leaving Mum in her grave. 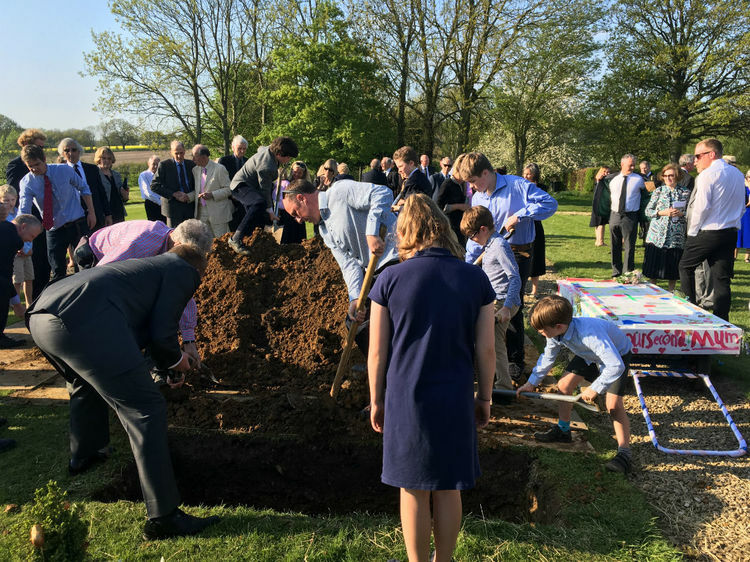 The following morning, our friend helped to compact the grave down with his digger, adding the final bit of earth to the mound above Mum. We gathered together and said some prayers and sang a song. Because we had largely filled the grave in ourselves the mound was quite large but after only a month it is now settling down. 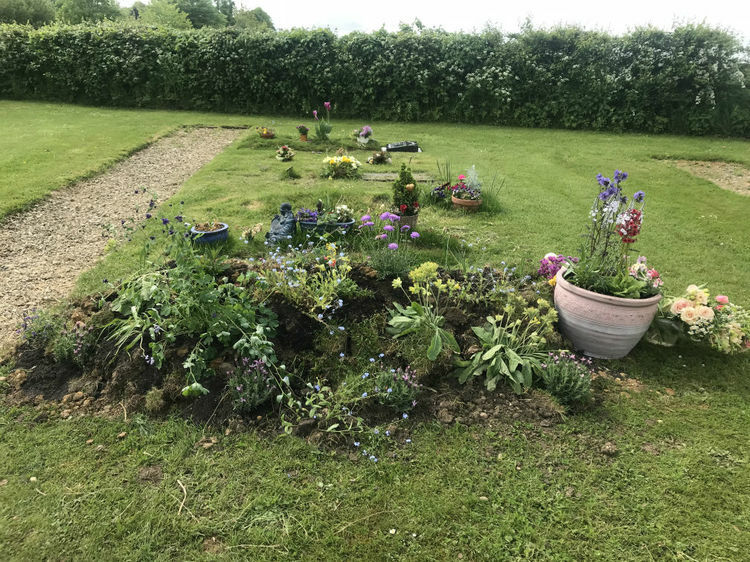 It will take some time for the grave to sink and for the soil to compact, but my efforts are now on creating a beautiful garden at Mum’s resting place and caring for the flowers. I went around our garden choosing wild bluebells, cowslips and forget -me- nots, and planted them on the mound. I am still a bit of a novice, but I am looking forward to planting lots of bulbs such as daffodils, tulips, snakeshead fritillaries and alliums in the autumn. 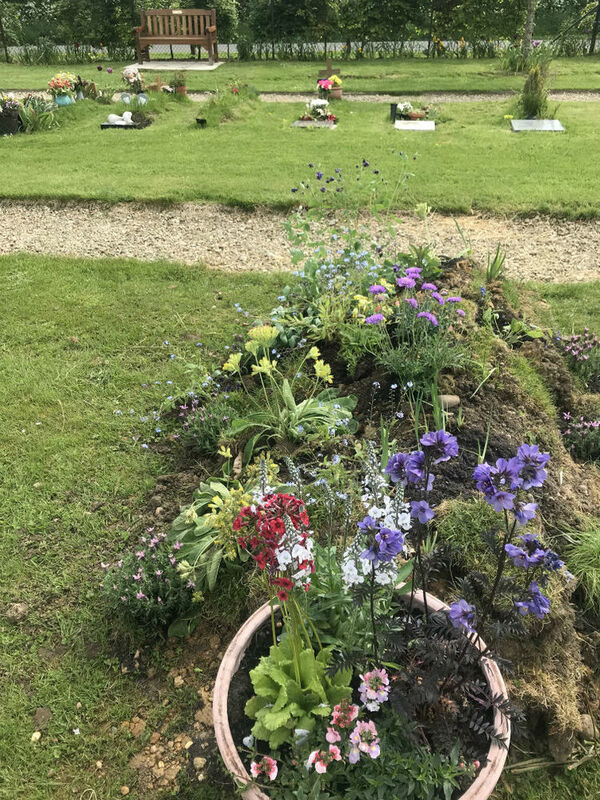 Caring for Mum’s grave helps me to deal with my grief, it is one of the last things I can do for her. We know that you need to wait at least a year before placing a stone on the grave and I find myself already discussing the stone with Dad. Fergus needs to remind me to wait, to let our emotions settle and to take our time with this. It is something we will revisit next summer, and we look forward to adding a beautiful stone to Mum’s grave. We are lucky that again, we will be able to do it all ourselves. Fergus painted a temporary marker using some waterproof paint on a piece of wood. My sister also created a simple free website for Mum where we have posted her video and photos of the service for those who could not be there on the day of the funeral. You can view it here . It may seem that arranging a funeral yourself might be stressful and involve a lot of work. 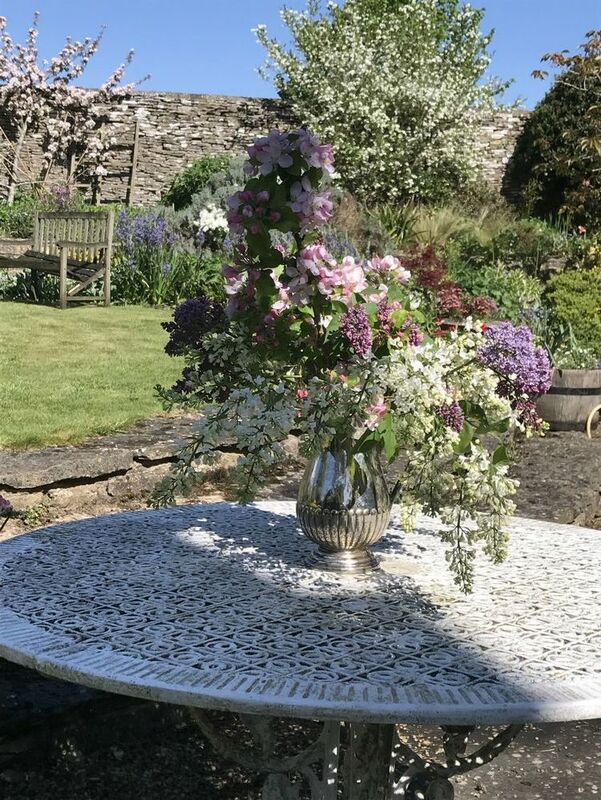 However, we found it all quite straightforward and being able to contribute to the process extremely important in that it helped the grieving process and kept us busy instead of just feeling miserable. Many of the guests commented how the funeral was especially moving and meaningful because of how it reflected Mum’s wishes. In terms of expense, we are sure that even after providing lavish food and drinks at the wake, we spent much less than the cost of a traditional funeral. So, as I sit and write this article in front of a serene lake, I feel at peace with Mum’s death. Of course, we are going to miss her, and grief is a strange beast, but our family came together in a way we had never experienced in giving Mum the send-off she would have loved, and our friends could feel our love for Mum and for each other, and we were able to give her the most dignified and heartfelt funeral possible. The Natural Death Handbook, published by the Natural Death Centre, is an invaluable guide. You must be sure that you have the energy, capacity and basic skills involved. You need an extended family or a group of committed friends. My mother was 5’7” and weighed about 52kg. 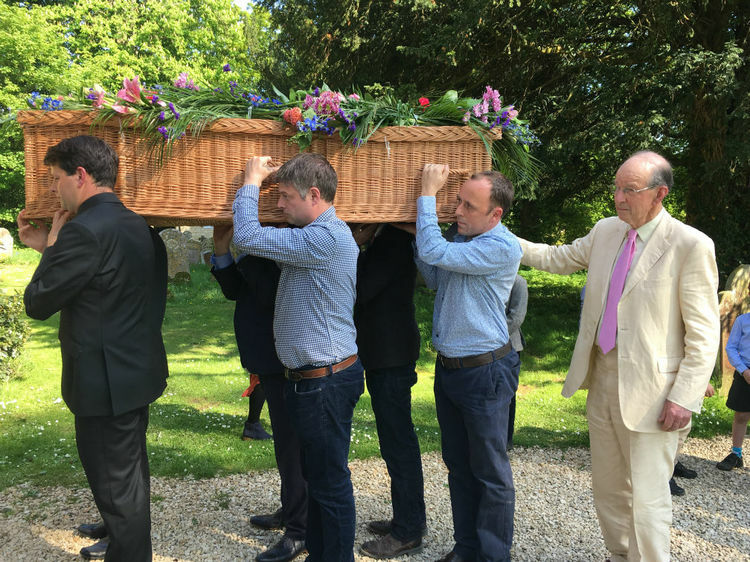 Even this weight was difficult to handle at times and required at least six pallbearers. For anyone significantly larger, the physical problems of handling the body and even fitting it in the box would become more challenging. Whereas it all worked brilliantly for us, there are many risks involved and by relating this experience, no responsibility is assumed, directly or indirectly, for others' attempts at emulation, nor for any inaccuracies in what has been written. We do not have any prior experience and we would urge anyone wanting to do something similar to seek further advice before doing the same, as every situation is unique. We had been told that a “home organised” funeral was perfectly possible and legal. The internet revealed the formalities to be followed following a death; call the GP to get a pronouncement of death and then get an appointment with the Registrar to obtain a death certificate. The registrar also advises on other statutory communications such as DHSS etc. The practical aspects we worked out for ourselves. The body needs to be kept at “Fridge Temperature”, which we assumed was between one degree and four degrees Celsius (C). How we did this is described below. The timing of the funeral needs to be agreed with the priest who will conduct it, leaving enough time to ensure that guests can be invited and have enough time to arrange their attendance, but otherwise, as soon as possible. We chose a Saturday because this is can avoid conflicts with work commitments. It is also important to check with the parish clerk that there are conflicting events in the cemetery. The Order of Service needs to be worked out, taking into account the wishes of the deceased and in conjunction with the priest. We designed the Order of Service using simple software and had it printed at a local printer who provided a 24 hour turn around. The burial spot must be agreed with the parish clerk to whom a fee is payable. Order a coffin, making sure that it will be delivered in good time. A good selection is sold online. Communicate with all those who will be interested in the passing and to invite their attendance at the funeral. Catering must be arranged with an estimate of numbers. This is not easy, so we chose a menu where unconsumed food could be frozen in small packs for future use. The first item is the most urgent as the body becomes rigid and at room temperature, decomposition starts, quite quickly. A sheet of 8’ x 4’ ¾ inch thick “Sterling Board (a type of chip board), which we asked the merchant to cut down the middle into 2’ wide strips. A roll of medium grade polythene. This was some 12 m long and 3m wide, although the roll itself was only 1m long when folded to fit in the car. All the above (which cost about£120) fitted, with a bit of a squeeze, into a VW Golf, with the rear seats down and the passenger reclined. There was only just room for the driver. Using 50mm thick Celotex would have left more space. 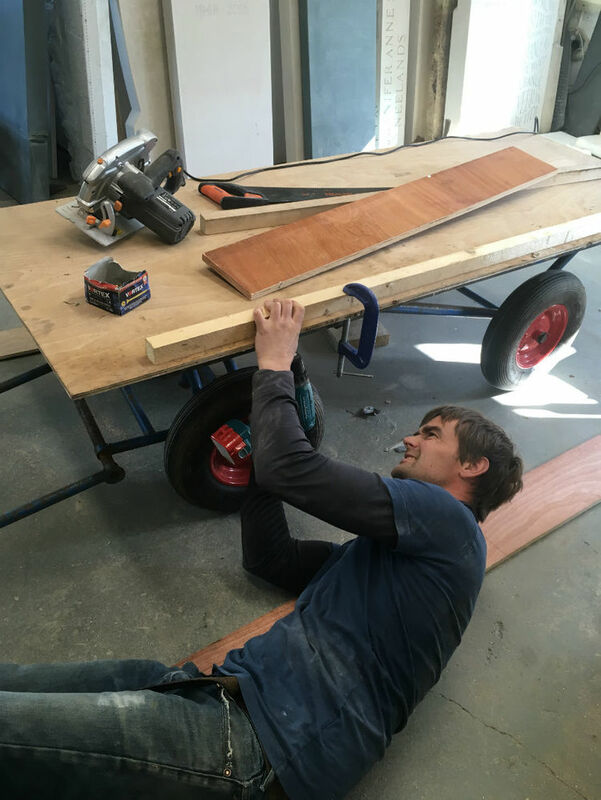 Make a “stretcher” by screwing one of the Sterling Board strips onto the two studs so they are beneath the board on either side. This becomes the structural base of the insulated box. The box, once it contains the body, must be lifted or moved only by means of the “stretcher” underneath. Cutting the Celotex as necessary with a saw, create a box as shown in the illustration. The pieces are held together with strips of duct tape. It is best to sketch the design of the box to ensure that it is large enough to accommodate the body and to ensure that the foam is cut precisely. From the local supermarket buy at least 20 bags of ice. If the storage time for the body is likely to be more than a few days, it would be sensible to buy (on-line) a quantity of picnic coolers that can be pre-frozen in your freezer and avoid the problem of leaking water from the melting ice. Ideally, a “max/min” thermometer should be placed in the box. Lay the box on the stretcher and gently pace the body (dressed appropriately) inside. Pack the ice bags around the body and place the lid on top and secure with duct tape. The stretcher and box can now be moved to wherever it is most convenient. This preferably should be well ventilated and unheated. Additional insulation can be provided by placing the box on a bed and covering the box with duvets. If possible, check the body and the state of the ice, daily. If the ice is more than half melted, remove the old bags and replace with new ones, or with picnic coolers. Immediately following death, we noticed that the jaw muscles relaxed leaving the mouth open. To close the mouth and to prevent ingress of any insects etc, we used thin surgical tape around the head to maintain the jaw closed and placed surgical gauze over the nose and mouth. We kept the body for eight days in a ventilated room with average external temperatures of around seven degrees C. The temperature in the box remained between one degrees C and three degrees C and we used some fifteen bags of ice, replacing half of these which had half melted after four days. On the day of the funeral, the coffin (which should be lined with fabric) was placed alongside the box. 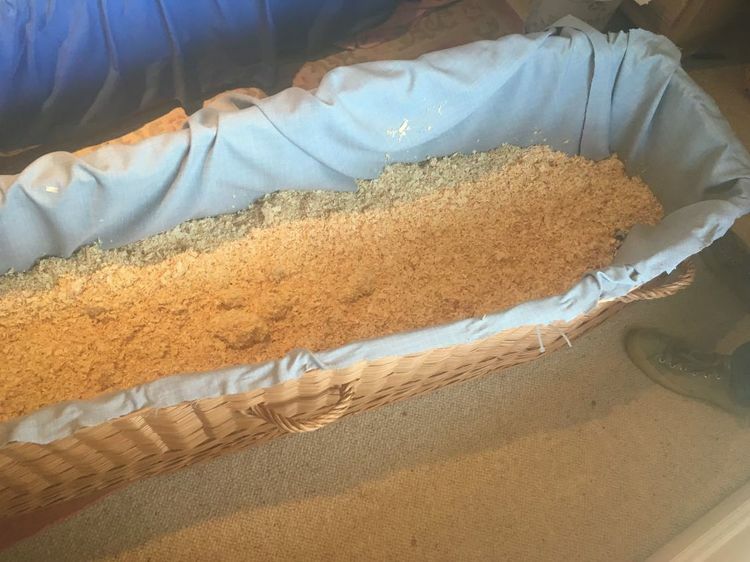 The body and its clothes were damp from melting ice, so it is prudent to place towels on the inside of the coffin and, as we did, place some absorbing sawdust under the towels. The sawdust also had a lovely smell. 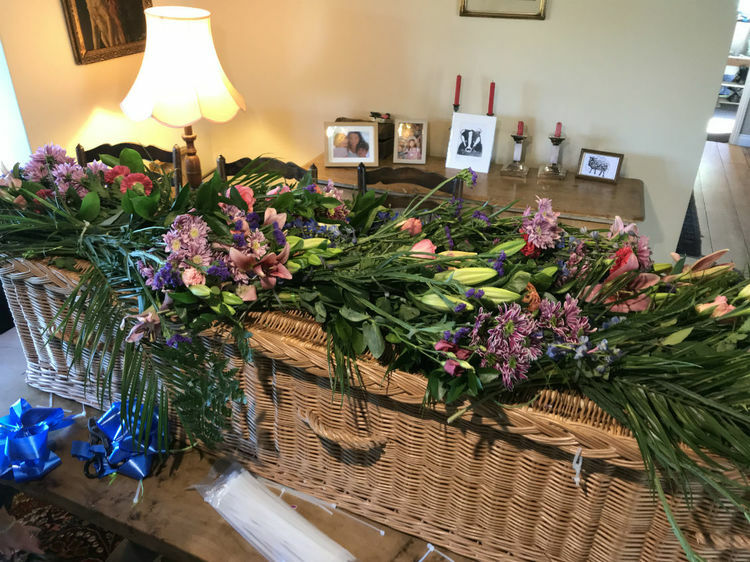 We then placed Mum’s wicker coffin next to her cold box and lifted her straight up and sideways and then down into her coffin a few hours before the funeral. We made sure the lid was then secured. In retrospect, we could have laid an additional sheet beneath the body to act as a sling to aid in lifting. The coffin was placed on trestles covered in fabric. We bought “Stanley” plastic trestles from Screwfix online. 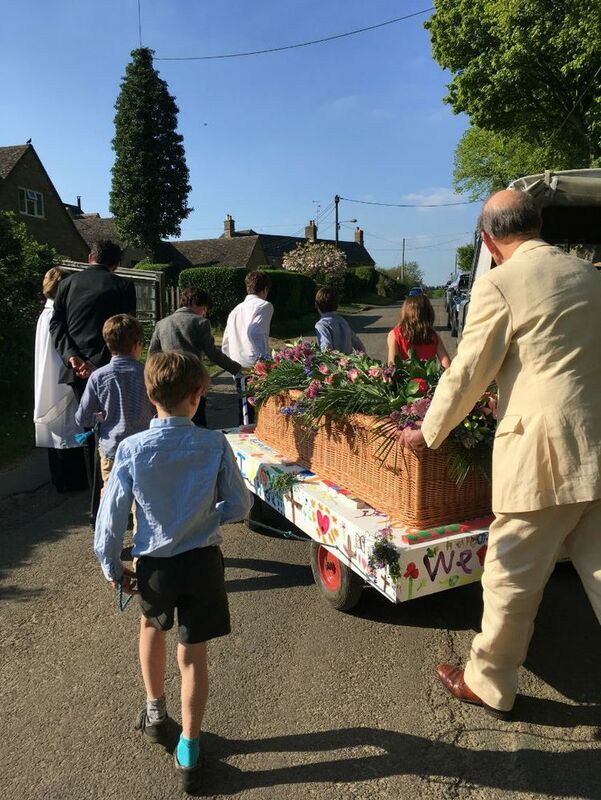 After the Service, the pallbearers carried the coffin out of the Church and onto a 4 wheeled ½ ton trolley which we had modified.